Reach 3:Upper Lamoille Access to Morrisville Oxbow Park (8 miles): This is a varied and interesting section through a rural valley, with occasional “rock gardens” that require attention. While Rt 15 is never far, paddling is still pleasant. Reach 4: Cadyville Falls to Watermen Brook (5 miles): The river here is quiet, remove, scenic, and offers great trout fishing. 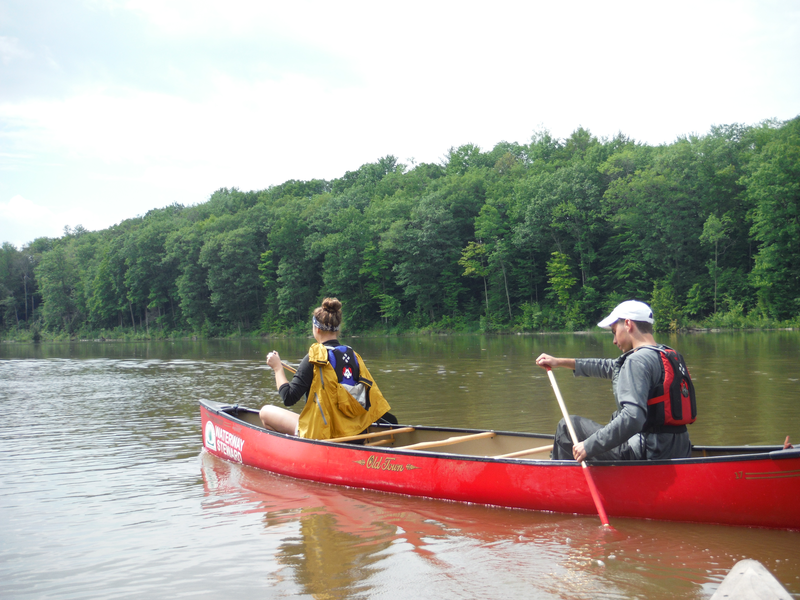 For a longer paddle (10 miles), continue on to visit (and portage) scenic Dog Head and Sloping Falls before taking out just before the Rt 15 bridge below Johnson (Behind the AG Self Storage Units). Arrowhead Lake (2-8 miles): Arrowhead Lake’s 8.8 miles of shoreline provide hours of flatwater paddling. Watch for ospreys, swallows, ducks, red wing blackburds, and snapping turtles in the marshy areas in the lake’s northern end. Currently three campsites on the river, spaced 10-15 miles apart, which make for a variety of overnight trips: Below are options for a single overnight, but we recommend setting aside time for a 3-4 day adventure! Day one (5-10 miles): For a short trip, put in below Cadyville Falls. It is a five mile (2 hr) paddle through the “Ten Bends” region to the McCuin Island Campsite. The river here is quiet, remove, scenic, and offers great trout fishing. Stop along the way at sandbanks to swim. Those seeking a full first day (15 miles. 4-6 hrs) can put in as high up as the Upper Lamoille Access in Wolcott. Note: infrastructure is limited at McCuin Island and get overgrown in the summer. Day one: Crossing Falls to Manchesters Campsite (1/2 Day) Put in below Crossing Falls, and continue through Johnson down to Ithiel Falls (scout river right). Stop for lunch and a swim at the beaches on the islands below the rapids. Carry on another hour to Manchester Farm Campsite. Day Two: Paddle on to a take-out in Cambridge. Consider a bike shuttle back to your vehicle via the Lamoille Valley Rail Trail. Day one: Put in at Cambridge or Jeffersonville. If you use VT Canoe and Kayak for shuttle service, you can use their launch, otherwise, the Dorothy Smith Access is your best bet. If you’re getting a late start, put in at the Boyden Farm Access. It is a four mile (2 hour) paddle to the campsite. Day two: It is an easy, three mile paddle to Fairfax Falls. End your trip here, or for a full day and some fun rapids, portage the dam and carry on to Arrowhead Lake.